From Father To Father, A Few Words Of Wisdom On Raising Kids With Autism Anthony Merkerson's son was diagnosed with autism. Then, his younger daughter was, too. "It was a heavy load," he says, until he started getting advice from another father farther along the same path. 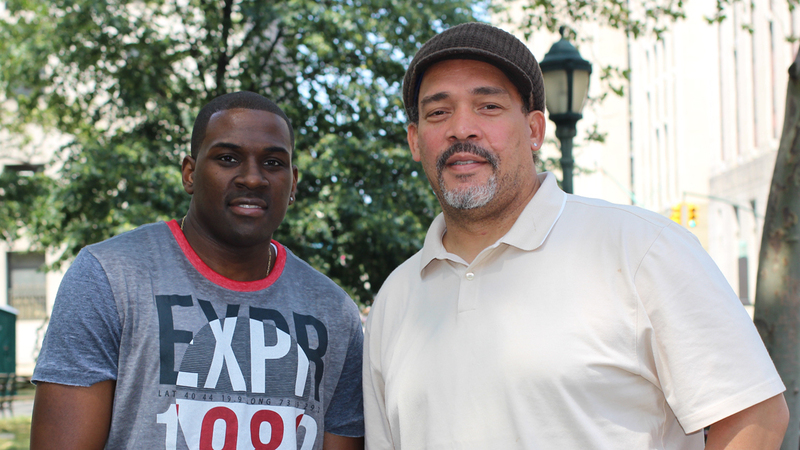 Anthony Merkerson and Charles Jones, on a visit with StoryCorps in New York City. Charles Jones' 12-year-old son, Malik, has autism. When he found out, Jones says, the news came as a shock — and fodder for plenty of fears. "It was like a shot in the gut," he says. "I thought my son would be nonverbal, that he would never say 'I love you.' But when he started talking he wouldn't shut up." 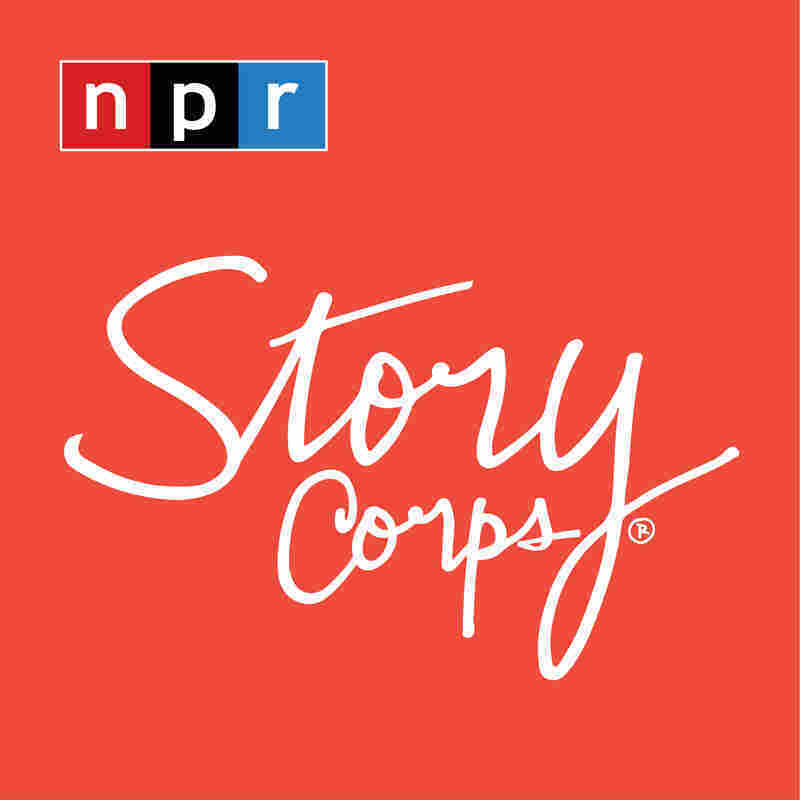 In a visit with StoryCorps, Jones spoke to Anthony Merkerson, a friend whom he met at an event for families of children with autism. Merkerson, a police officer for New York City's Metropolitan Transit Authority, has kids with autism, too, both of them younger than Jones' son. And he came to Jones with a few questions — like this one: What was the hardest day he ever had with Malik? "It's not his bad days that are hard; it's my bad days that are hard," Jones answers. He recalls a time when he was cutting Malik's hair. Scared by the sound of metal grinding, Malik began to resist his father. "I got so frustrated, and I forced him," Jones says, "like I held his head, and I could see it hurting him. And then afterwards I broke down." He says Malik came to him later and told him not to worry: "I'll be OK next time," Malik said then. "It was a stain on my brain for a long time," Jones tells Merkerson. "And I'm working on it. I'm a work in progress." And Merkerson understands well: "I've learned — like patience, you've just got to have it," he says. From the start, he says it was difficult just to raise a son with autism. Then, his daughter was diagnosed, as well, when she was 2. "Two kids on the spectrum. It's like a heavy load, like picking up a mountain," Merkerson says. "And back then, I was in a shell, I wasn't even explaining how I was feeling." When he met Jones and his son, Merkerson says things began to change. "It's been totally different, just the fact that you're not alone dealing with this. That right there changed my life, period." I'm working on it. I'm a work in progress. Their worries have by no means gone away, though. For instance, despite being just 12 years old Malik is already 5 foot 9. "And when he gets excited, he flaps his hands really hard. This is not abnormal, this is as normal as rain for him," Jones says. "But my fear for him has been that somebody sees him, and they interpret his body language as something that it's not. So even with a smile on his face he's going to be threatening to people." As a police officer, Merkerson harbors fears of his own for their children. And that's part of the reason why, Jones says, "The best thing I can do is teach him what's socially acceptable, and what can be misperceived as a problem." Not that he likes it. "I hate to have to teach him those things, and I don't want to take his innocence away either, but in time he'll know," Jones says. "And you know what? Who he is today, I never thought he'd be, so I know there's possibilities for him." Audio produced for Morning Edition by Jud Esty-Kendall with Nadia Reiman and Von Diaz.